Welcome to the Everglades Safari Park. On Mother's Day I treated my mother and aunt to an airboat ride in the canals that labrynth through the Everglades for spotting alligators. 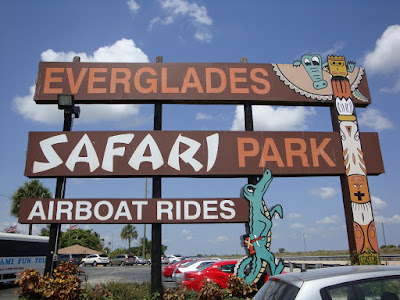 This posting will review this park's airboat rides, and the other offerings as promoted on their website http://www.evergladessafaripark.com/ . 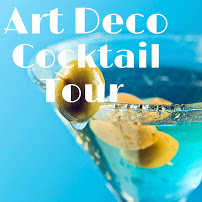 For more pictures and my diary account, visit my personal blog by clicking here. 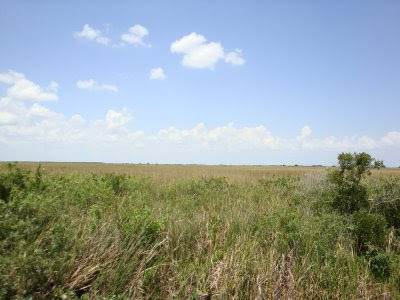 The Everglades Safari Park is closer than we originally anticipated. 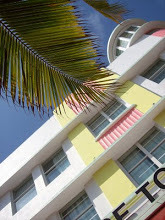 Located on Tamiami Trail (SW 8th Street) the drive was little more than half an hour from downtown Miami. A definite plus. Prior research indicated the cost per person was $23.00 (no discounts for Senior Citizens). Upon arriving, the entrance looked like every other airboat tour attraction on Tamiami--like a solitary outpost in the middle of the wild, a gravel parking lot, and billboard-size sign. These are not Disney-esque attractions with cute and colorful animated characters, brick roads and mechanical rides. This is the true outdoors with no adornments. Just think of Crocodile Dundee turned Alligator Dundee from the Outback of Australia to the Everglades of Florida. We embarked on the airboat with a group of about twenty people. Our alligator canal tour guide manned the boat and slowed down as we spotted alligators. Despite the late hour, we were surprised to see as many alligators. Normally the best time to ride the airboat is morning from 9am to 11am. The airboat ride lasted 30 minutes. We learned that this year was the worst drought in nine years. Water levels are two to three feet below average. Hence the reason why we saw mostly smaller gators. 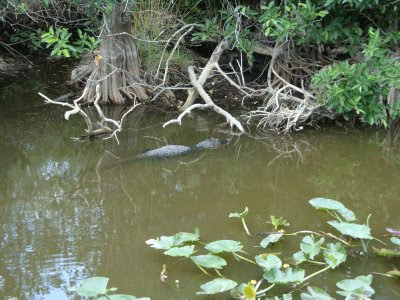 The "biggies" lurked in deeper waters --normally closer to the platform where the airboats docked. We were literally circled by 200 pound - 300 pound salivating alligators. 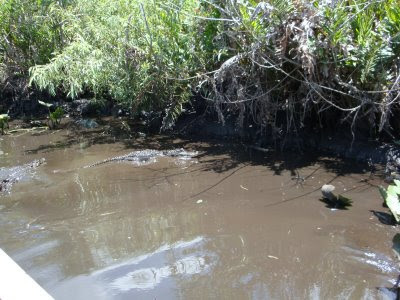 Lower waters mean less food for these reptiles. Don't worry. They survived a million years--they will survive a million more! 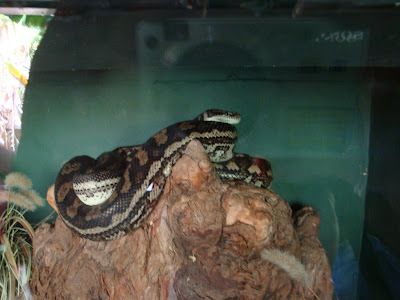 After the airboat ride, you are ushered into a "museum" showcasing live snakes behind glass walls--the harmless and dangerous kind. On the outer wall a biology lesson on the Everglade's ecohabitat, in writing and faded drawings, lined the walls in this cave-like rotunda. 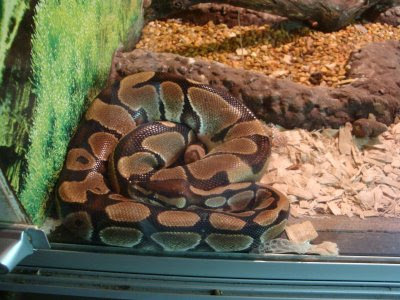 The fascination with the snakes was watered down by the fact there were no signs or "you won't die if this one bites you" snake classification or "this snake can wrap around and crush your body". Which was which? Four snake tanks, a turtle or two was the entire museum. At least some signage would have been helpful for educational purposes. Rating: well it did not meet expectations per website. 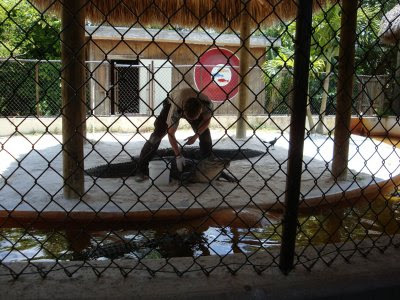 After the "museum", is the "alligator show". Boy, who knew alligators were so animated. 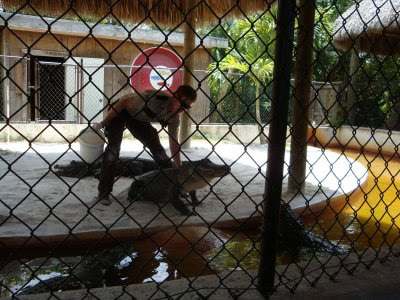 Meet "Flipjaw", he was the main attraction (see picture below and the alligator staring straight at you). Flipjaw could move on command, open his jaw, eat, and give kisses. He was only 7 years old and alligators live as long as humans to their 80's or 90's. Jeff was the young and new trainer. Having started four months ago, the gators already nibbled at his arms/hands four times. But no bites--otherwise Jeff would be missing a forearm or phalanges (fingers). Jeff explained their survival secret. These creatures can eat anything and retain only muscle. If the alligator consumed a ten pound animal, the gator retains about eight pounds of pure muscle! They lounge around, eat large quantities and not gain fat. How jealous are humans!!! I asked which was bigger the crocodile or alligator. In general, the crocodile wins. The "show" lasted less than 10 minutes. Enough to watch, learn, gasp oohs and aahs and keep the children's attention. Then we followed the boardwalk Jungle trail and came upon a couple of fenced in crocodiles and other alligator exhibits. That was the highlight of the entire trail. Unfortunately we did not spot any exotic birds or flora. It seemed deserted. Perhaps it was the increasing heat and drought which kept the animals at bay in the shade. Alligator Island? Oh that patch of land with oversized pond in the center? Well, the alligators must have been playing "hide-and-come-seek us you silly humans". Again, it must have been the dead heat of the sun. While I expected a little more activity, overall we enjoyed the event. 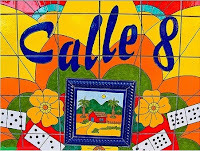 It was safe, fun and we learned about the original inhabitants of South Florida. This is not the best event for families with very small children under the age of seven but it is educational for older kids. 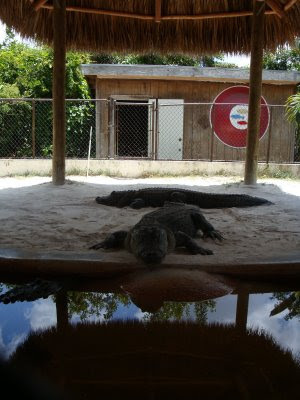 If you have visited an alligator or airboat park, share it with us by leaving a comment below! Which one did you visit? What did you see? Was it worth it? (Note: your comment will not appear right way until it is reviewed for spam and foul language. Also there is no confirmation once you submit the comment, a weakness of blogger). In the tradition of Into the Wild, the riveting story of a young man seeking his own truth and finding adventure and the awesome, unforgiving power of nature. Will Chaffey was 18 when he boarded a plane in New York bound for Australia. 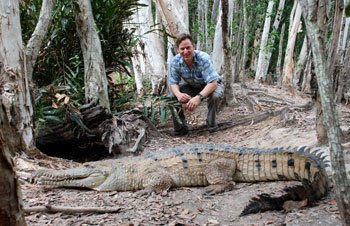 Taking time off to work and travel, Will met an enigmatic wanderer and herpetologist named Geoff there and with him crossed the inland desert to the tropical northwest coast, home to the saltwater crocodile, a predator surviving from the age of dinosaurs and a known man-eater. Together they devised a plan to explore the remote Prince Regent River, a trek so dangerous it had never been attempted by white men. Passing through harsh, primeval country, shadowed by Aborigines, and physically worn down, they find themselves locked in a life-and-death struggle when their food runs out and, unable to leave, they are stalked by a hungry crocodile. Filled with scenes of great natural beauty, Swimming with Crocodiles is at once the affecting account of a journey into adulthood and a hair-raising epic of survival. I never thought of alligator spectating. It seems safe and entertaining. Will give it a try.